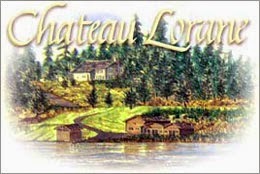 Our wine selection now includes a few bottles from Chateau Lorane. Since 1991 they have been producing several unique wines (and mead) at their winery in the Southern Willamette Valley. We have 3 of their fruit meads, plus some of their red wines: 2010 Leon Millot, 2009 Cabernet, 2006 Malbec, and a superb Marechal Foch Port! Chateau Lorane's meads are made with local and organic fruit, plus many of their wines are made with grapes from certified organic vineyards.